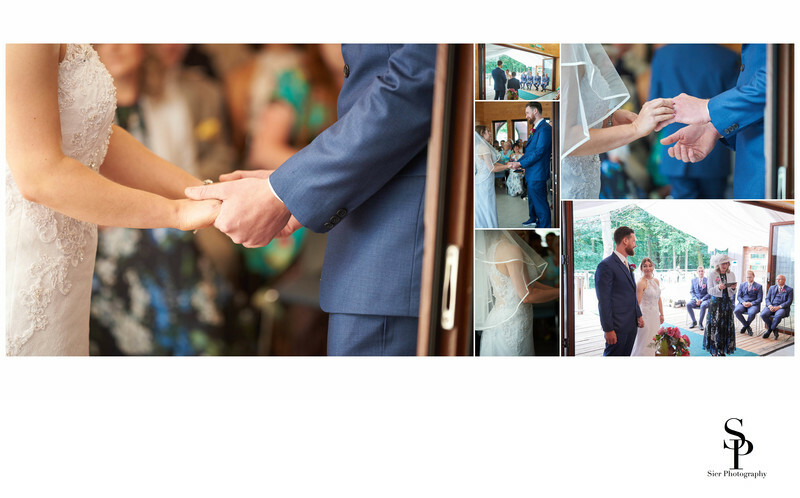 This is a wedding album page from a wedding ceremony at the JG Graves Woodland Discovery Centre in Ecclesall Woods in Sheffield. The bride and groom hold hands in the first image as they exchange their vows with each other in front of their witnesses. They can also be seen exchanging wedding rings in the images as the ceremony continues for the happy couple. This is one of the hidden gems of a wedding venue in Sheffield. Most of the more familiar locations are churches and hotels, there are very few truly outdoor locations like this one nestled away in the woodland on the outskirts of the city. Wedding photography in Sheffield takes us to some wonderful venues and even after all the time we have been documenting weddings we often get to go somewhere new, one such venue in 2018 was the Woodland Discovery Centre in Ecclesall woods. These are some truly ancient woodlands at one time forming part of the world famous Sherwood Forrest and could well have seen Robin Hood riding past, assuming of course he ever existed! Some of his band of merry men came from close by, John Little of Hathersage just over the hill and Robin himself hailing from Loxley only a few miles away.